Beautifully engraved SCARCE certificate from the SmarterKids.com. This historic document was printed by the Security - Columbian United States Banknote Corporation and has an ornate border around it with a vignette of the company logo. This item has the printed signatures of the Company’s President ( David Blohm ). 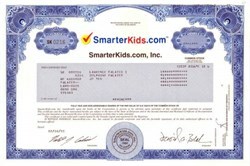 Nov. 15, 2000-- SmarterKids.com, Inc. (Nasdaq: SKDS), a leading online educational toy store and Earlychildhood.com, LLC (ECC), a leading nationwide manufacturer and retailer of educational products founded in 1985, announced that the board of directors of SmarterKids.com and ECC's management committee agreed to combine their respective companies. The new name is LearningStar Corp.
October 10, 2001 - LearningStar Corp. (NASDAQSC: LRNS) announced today that the company intends to change its corporate name to "Excelligence Learning Corporation." LearningStar's board of directors believes that it is in the best interests of the company to change its corporate name to "Excelligence Learning Corporation" in order to avoid any potential confusion between the names "LearningStar Corp." and "LearnStar L.P." LearnStar L.P. is a Dallas, Texas based entity that develops and markets interactive educational technology to primary and secondary schools. LearningStar Corp. will begin doing business as Excelligence Learning Corporation immediately and will submit the new name for stockholder approval. Excelligence Learning Corporation is a leading developer, manufacturer, and retailer of educational products to child care programs, preschools, schools, and consumers. Formed in spring 2001, through the combination of Earlychildhood LLC and SmarterKids.com, the company provides quality educational products and programs for children from infancy to 12 years of age. With scale, growth potential, proprietary product offerings, a multi-channel distribution strategy, and extensive management expertise, Excelligence Learning Corporation's mission is to help further children’s education and to reinforce the connection between schools and homes.